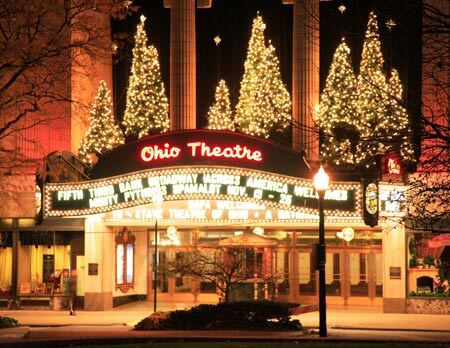 The Ohio Theatre is considered by many to be the crown jewel of restored theatres. At the time of its building, Marcus Loew thought so too, although he never got to see his masterpiece completed in 1928. This magnificent theatre had been slated for demolition in the 1970s. They even had a farewell performance. But thanks to the enthusiasm of a few individuals that had the energy and vision to see what a star, visitors can still enjoy the theatre as it was meant to be enjoyed. The Ohio Theatre was originally named the Loew's and United Artists Ohio Theater and it was going to be Marcus Lowe's favorite theatre. The original construction cost was $865,000 when it opened in March 1928. However, the furnishings alone, when everything was added up, ran over $1,000,000, an astronomical figure for the times when the average wage was less than $5,000 per year. Although it would be Lowe's most lavish theatre, he would never enjoy the show since he died 6 months before the grand opening. Lowe's vision for his last theatre was to have only the finest in workmanship, style and furnishings. He hired Thomas W. Lamb, America's premiere theatre designer of the day. Lamb had recently designed the Madison Square Garden in 1925, New York's Ziegfeld Theatre in 1927 and here in Columbus, the RKO Palace Theatre located next to what is now the Leveque Tower. The exterior of the Ohio Theatre is mostly unassuming although classical in design in the Beaux-Arts style. It is made of stone and terra-cotta. While the exterior design is rather plain except for the lavish marquee, the interior is anything but plain. Loew sent Dornan around the world, selecting art and furnishings for the theater. She even went on Safari to obtain authentic decorations for the "African Corner" in the lower lounge. The first show on March 17, 1928 began with an orchestral performance followed by a newsreel followed by a live revue, and finally the feature film, Divine Women starring Greta Garbo and Lars Hanson. 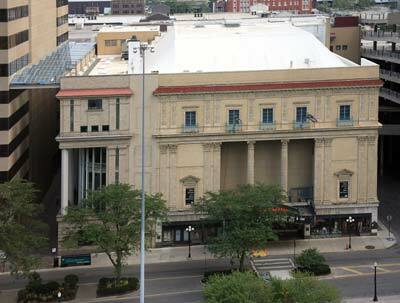 One of the major jewels that still is a major part of the Ohio Theatre is the "Mighty Morton." Built for the Ohio Theatre, the Robert Morton Theatre Pipe Organ is still giving audiences a thrill that is unequalled in the field of entertainment. Once these magnificent instruments were common through the country (in the 1920s, there were more than 10,000 theatre pipe organs in operation). Today there are fewer than 40 surviving pipe organs in their original installation. Today the organ is considered one of the finest theatre organs in existence anywhere. The magnificent Morton Theater organ was installed in 1928 for $21,000. The grand chandelier is supported by a steel bar through the ceiling support beams. Every 2 years, the chandelier is lowered for a thorough cleaning and light bulb change (which takes 2 hours to bring down and requires 7 people to operate the crank). 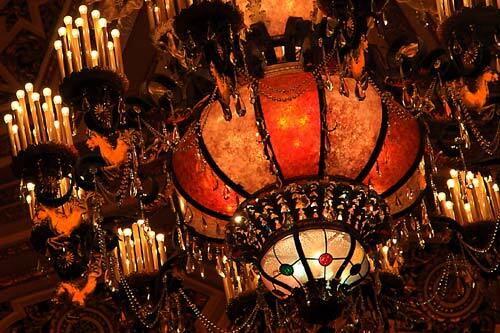 There are 99 lights inside the chandelier and some 200 candle lights arranged around the ornate fixture. The plaster ceiling is suspended from the roof by cables and the side panels are 23-carat gilded shells. The entire ceiling, chandelier and stained glass panels can be lit in several colors. Facing certain destruction, a group of concerned citizens rallied to save the Loew's Ohio Theater from the wrecking ball in the late 1960s. On March 2, 1969 just months from scheduled demolition, the Columbus Symphony Orchestra performed at an open rehearsal to a packed hall inside the theater. This performance proved to any skeptic that the theater was able to draw a big crowd, and that the theater was outstanding for live performance. In fact, the acoustics were excellent, even better than most modern music venues at the time. The group of concerned citizens formed the Columbus Association for the Performing Arts (CAPA). Their goal: save the Loew's Theater and turn it into a high quality performance hall. They were successful and CAPA was able to later buy the property for just $2 million-- a real bargain. Then the real work began: restoring the hall to its original splendor. With decades of wear and lack of documentation it was difficult to tell what the original color scheme was until a plaque in the lobby was removed revealing the original color palette. The stage, backstage area and orchestra pit were all inadequate for modern performances and were re-designed. They even found a textile mill willing to reproduce the elaborate carpet patterns of the original carpeting. The official reopening concert took place in October 1970, with the Columbus Symphony Orchestra playing Beethoven's Consecration of the House, with maestro Evan Whallon at the podium. The stage was enlarged in 1984 to double its original depth, and the entire stage floor was resurfaced in fir and maple. The main curtain at the Ohio Theatre weighs 700 pounds. Originally the Loew's Theater seated 3,079 guests. However, during a recent major renovation, the main floor and loge seats were replaced with more comfortable, wider seats, reducing the seating to 2,897. Also added at the time was the $16.5 million John W. Galbreath Pavilion. 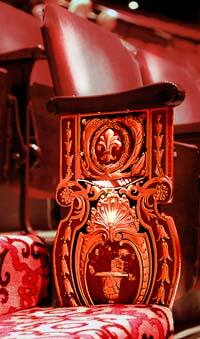 TRIVIA: in the lobby there are a number of bronze plaques honoring contributors and donors to the Ohio Theatre. On one grouping of 3 large panels with lists of names. On one of those panels is the name of one musical group, all the rest are individuals. The original Ohio Theatre Lobby was too small to accommodate the larger performances that would soon follow after the remodeled theatre. The pavilion was constructed on the east side of the main theatre to provide additional space for intermissions as well as providing space for special events. The new space also provides rehearsal space, dressing rooms and administrative offices. 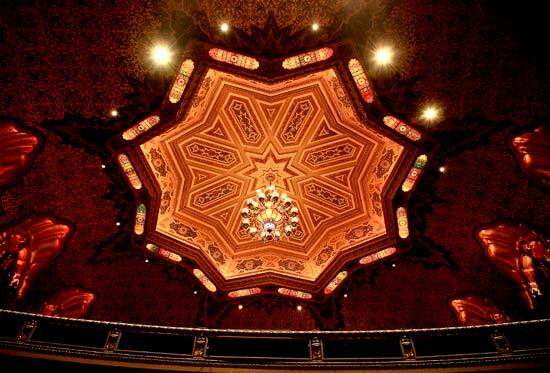 Ohio Theatre's lush interior, excellent acoustics, and state-of-the-art stage facilities have made it a favorite of leading performers including Carole King, Julie Andrews, Yo-Yo Ma, Yanni, Anne-Sophie Mutter, Kenny G. Canadian Brass, Liza Minnelli, John Denver, Kodo Drummers of Japan, the Boston Pops, Garrison Keillor, Lyle Lovett, Itzhak Perlman, and Dan Fogelberg. CAPA also offers once a year their new Theatre Crawl that gives about a 4 hour tour of the 3 queens of theatre in Columbus: THE OHIO, THE PALACE, and THE SOUTHERN. There is no set date for this special once-a-year tour as it depends on having all 3 venues being idle on the same day at the same time. The Ohio Theatre was part of the Loew's chain of theatres and the creation of Marcus Loew who helped form the film production company MGM (Metro-Goldwyn-Mayer). Loew began with a small investment from money saved from menial jobs, and bought into a penny arcade business. He later acquired a nickelodeon and over time he turned Loew's Theatres into the most prestigious chain of movie theaters in the United States. 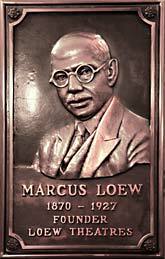 Loew died in 1927, six months before the Ohio Theatre opened to the public.